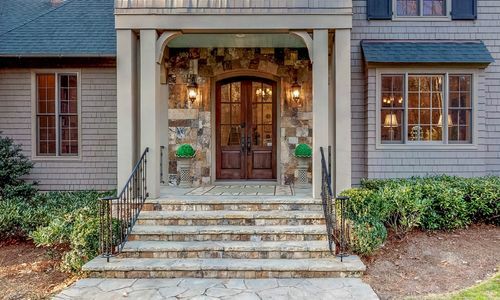 When it comes to Highlands NC homes front porches attract buyers. In fact, the front porch is one of the most coveted features for new homes being built. In the Highlands NC area many of our homes have porches. As a result, sellers should showcase this feature. The front porch is a fabulous welcome mat for any Highlands NC home for sale. How can you showcase your front porch? Start with the walkway up tot he steps to the front porch. Pay attention to the stone, concrete, or gravel pathway and make sure it is well edged and clean. The driveway and pathways that link a home to the road should always be neat and clear to walk. Furthermore, when they can be landscaped, free of weeds, and perhaps edgemwith flowers your Highlands NC home’s curb appeal will be boosted. The steps up to the front porch should be equally clean and clear. If the steps are wood make sure they are painted. Additionally, make sure there is good traction on the steps and that they are never slippery. These steps lead to the porch and the front door. Once on the front porch take a survey. Is there room for outdoor seating? If so arrange the seating in such a way that the porch looks comfortable and welcoming. Just like staging a living room make sure that furniture profiles are appropriate – not too large for example when spec is limited. Do planters make sense? Perhaps hanging plants like flowers or ferns? The front porch of a Highlands NC home for sale matters. Make it welcoming and not overwhelming. Contact our team at Berkshire Hathaway HomeServices Meadows Mountain Realty today to learn more about Highlands NC real estate. We welcome the opportunity to update you on market conditions while sharing staging tips at the same time. Let our knowledge and experience serve as your guide to Highlands NC homes. Click here to read “3 Home Exterior Looks to Watch” from REALTOR Magazine.